this topical treatment allows the submersion of just arms and legs. Built under Stalin and the USSR’s later leaders, Soviet sanatoriums were a place for workers to holiday courtesy of a state-funded voucher system. 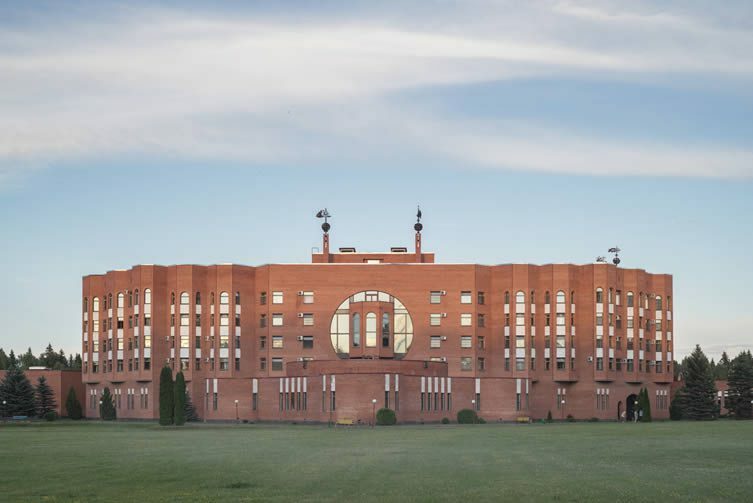 Conceived in the 1920s, millions of natives would travel to what are now considered architectural wonders — a combination of medical institution and spa where visitors could reinvigorate, ready to return to exacting communist work with newfound energy. Monitored by health professionals throughout the stay, a sanatorium break would include specialist treatments like crude-oil baths, radon water douches and stints in underground salt caves, various sanatoriums becoming renowned for the unconventional care they provided; each a breathtaking example of utopian thinking. A leftover from Soviet times that is steeped in rare charm. 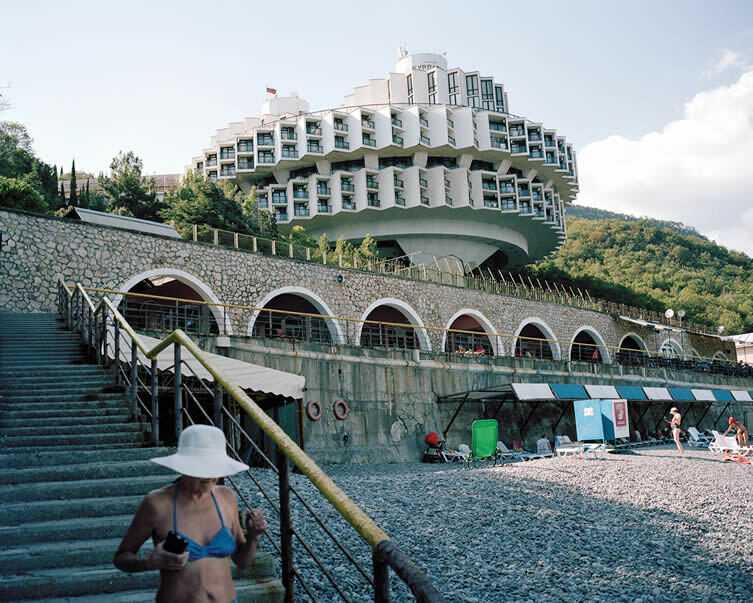 Whilst some of the centres now reside in terrible states of decline, many still operate offering a suite of Soviet-era treatments to guests — something Maryam Omidi explores in the FUEL-published book, Holidays in Soviet Sanatoriums. Documenting over forty sanatoriums from Armenia to Uzbekistan, journey with Omidi as she uncovers the rather unorthodox treatments left behind by this oft-overlooked Soviet institution — magnetic sand believed to alleviate a ailments related to the heart, blood, circulation, joints and bones; crude-oil that can ‘heal neurological diseases, skin conditions and impotence’ … the times may have changed, the curiosities have not. 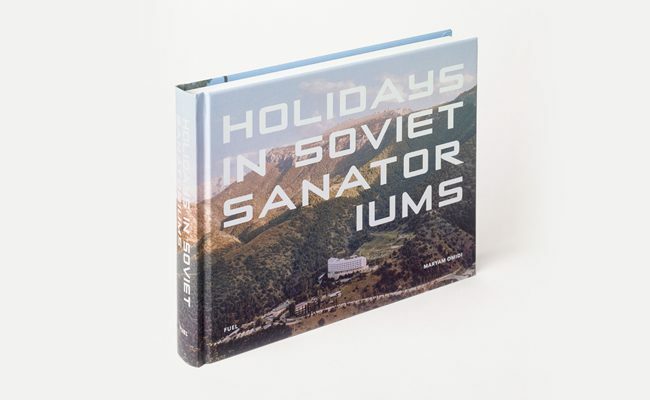 With photography by Claudine Doury; René Fietzek; Olya Ivanova; Natalia Kupriyanova; Dmitry Lookianov; Egor Rogalev; Vladimir Shipotilnikov; and Michal Solarski, Maryam Omidi’s Holidays in Soviet Sanatoriums is available now from FUEL. Druzhba sanatorium overlooks the Black Sea. Two concrete circles, 76 metres in diameter, contain the guest rooms. The saw-tooth design allows each one to be orientated towards the sea. 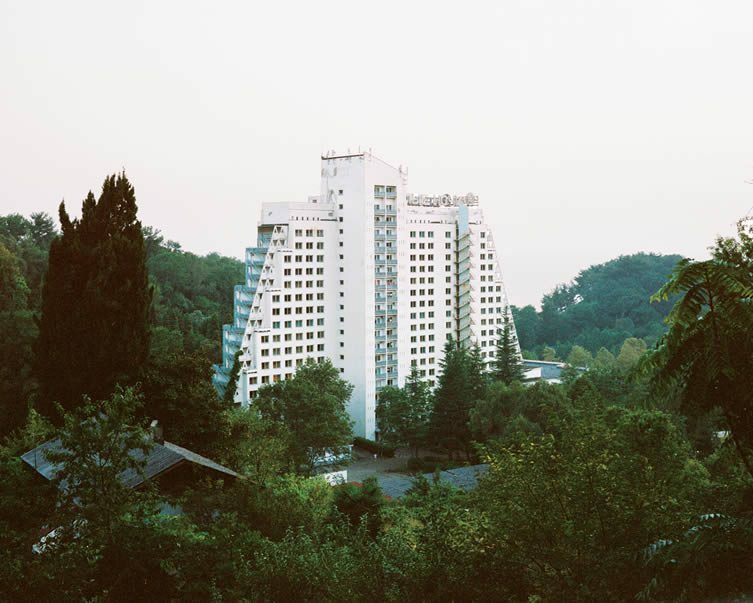 The white modernist sanatorium, built in 1978, is set amid a lush botanical garden that spills over on to a stretch of private beach. Guests bathe in the silky smooth crude oil for up to ten minutes at a time before being scrubbed down by an attendant and then showering. 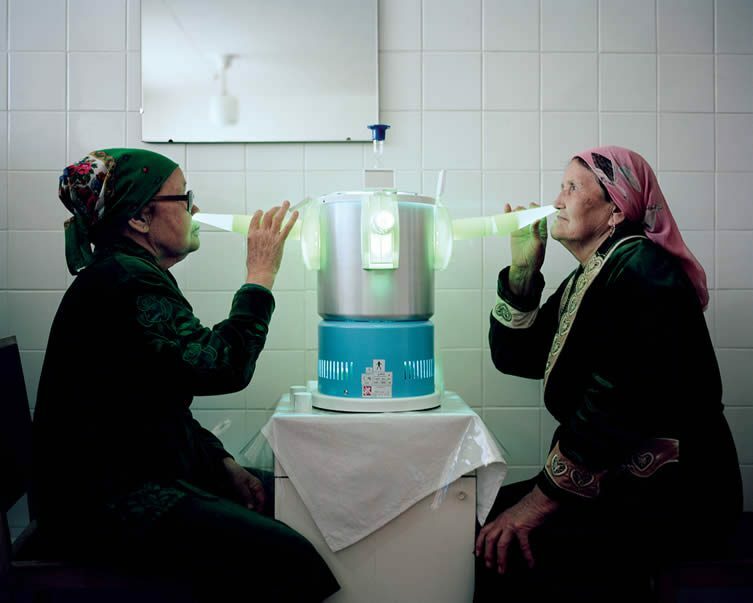 Ultraviolet light-emitting sterilisation lamps are placed in the ear, nose or throat to kill bacteria, viruses and fungi. 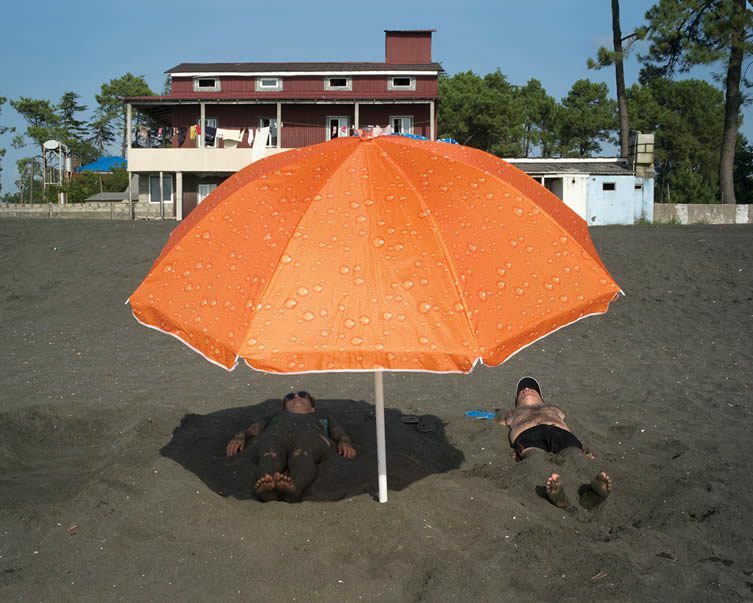 While some sanatoriums offer mud baths or mineral-water therapies, Kolkhida’s main attraction is its magnetic sand. The glittery black powder that coats the beach is believed to alleviate various ailments related to the heart, blood, joints, circulation and bones. Once a favourite destination for high-ranking Soviet officers, Tskaltubo, a spa town in west-central Georgia, is now but a shadow of its former self. Here patients exercise in mineral water at Bathhouse 6, which once included a private room for Stalin. A guest undergoes magnetic therapy. 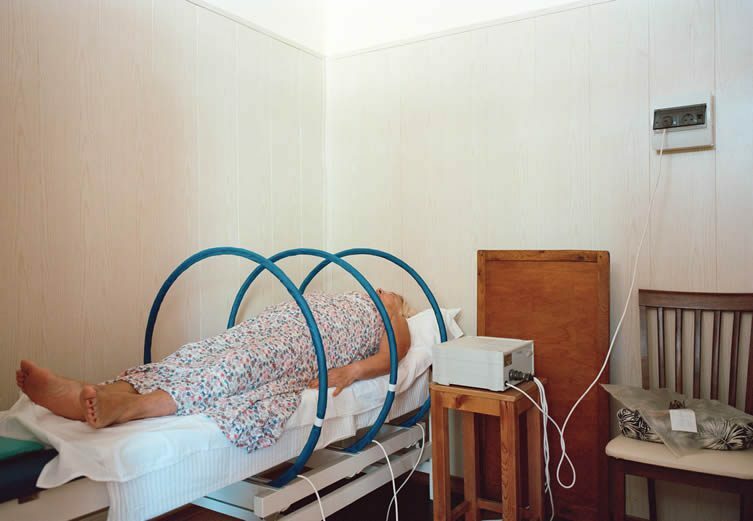 Considered a pseudo-treatment in the western world, this is a popular therapy in sanatoriums where it is used to alleviate symptoms of pain across a range of diseases. 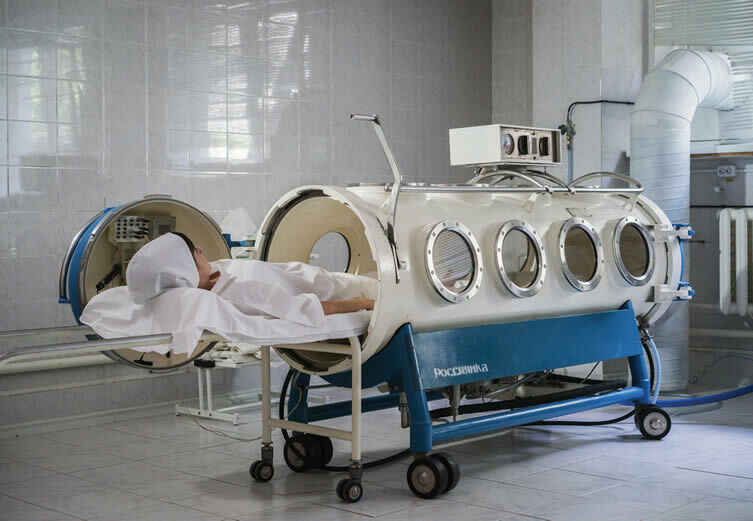 A hyperbaric oxygen therapy chamber. This therapy is used to treat decompression sickness, carbon-monoxide poisoning and even autism. Although not strictly a sanatorium, Klyazma is evidence of this new development. 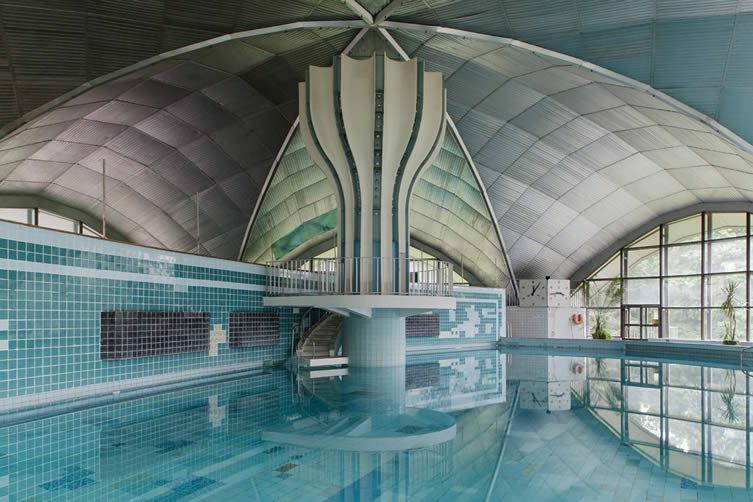 Built in 1963, it forms part of a group of four pansionats (the others being Berezki, Podmoskovya and Dubrava) constructed around the Klyazminsky Reservoir on the outskirts of Moscow to provide the benefits of sanatoriums close to the city. 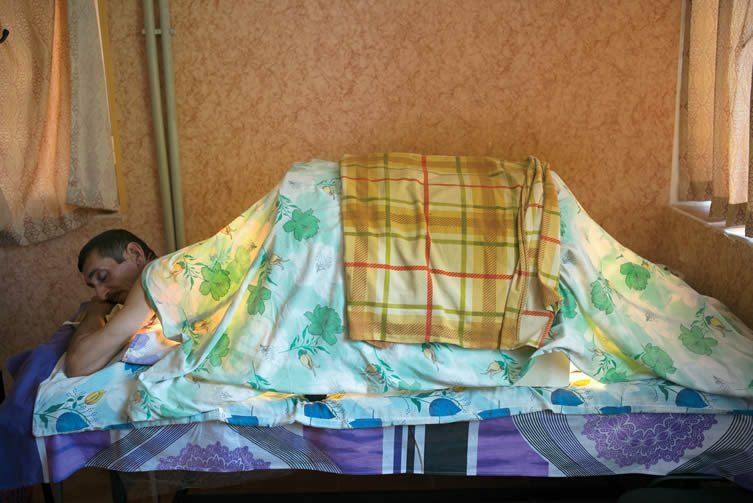 A guest relaxes during a luminotherapy session. Reshma sanatorium opened in 1987 and was designed as a modern, red-brick interpretation of a castle.